With the U.S. election looming, we are once again putting a candidate through their paces. Previously, Donald Trump was given America to run in Democracy 3, while Hillary Clinton took on Vikings as Queen of Deheubarth in Crusader Kings II. Now it’s the turn of Clinton’s Democratic Party opponent, Bernie Sanders. Since we’ve tackled the present and the past, it’s time to hurtle forward into the enigma that is the future! In space! 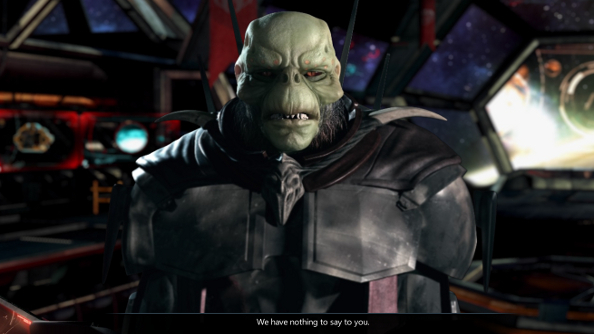 Yes, we’re giving Bernie Sanders a whole space empire to look after in Galactic Civilizations III, Stardock’s massive 4X game. The Bern has been flung through time, landing in the 23rd century, where humanity has discovered the hyperdrive and is now starting to stretch out into the cosmos. Being almost 200-years-old, Bernie is the most experienced politician on the planet and is quickly put in charge of the burgeoning galactic superpower known as the Terran Alliance. Please stand for the Global Anthem, courtesy of Bad Lip Reading. Sanders’ first week in power is a busy one. Orbiting Earth are three ships waiting for orders, a shipyard waiting to be put to work, and then there’s the question of which technology Earth’s scientists should work toward, as well as a big decision needing to be made in regards to the planet’s construction efforts. First thing on the to do list: send those ships off into the unknown. The scout is set to explore the galaxy as it sees fit, while the survey ship jets off to look for anomalies peppering the vast space between solar systems. The last ship is the colony vessel, which is ordered to check out a neighbouring star system for habitable worlds. Mars is vaguely habitable, but is really just a last resort. Too dusty. We’ve all watched The Martian, right? Awful place. A slew of research options are available right off the bat, but it’s the universal translator that’s made a priority. It will allow Sanders to chit chat with alien leaders without starting a war through miscommunication. You don’t want to call a Drengin’s mum fat when you just meant to talk about interplanetary trade deals. Finally it’s time to gaze upon Earth and start building. Sanders splashes out on a factory straight away, increasing the planet’s manufacturing output. Back through the mists of time, in 2016, Sanders proposed the Rebuild America Act, the goal of which was to invest $1 trillion into the American infrastructure over five years, which would also support 13 million jobs. Doing that on a planetary scale is… a big undertaking. This single factory is the start. The factory is followed up with a fancy new research laboratory, increasing the speed of mankind’s advances. Robots! Space lasers! Death Stars! Sadly none of these things seem likely, given Sanders’ stance on war. Sure, he reckons a “robust military” should be kept at the ready after all other options have been exhausted, but Death Stars probably don’t feature in that plan. With all the initial issues handled, Sanders gets into the rhythm of running a space empire. He sits in his comfy space chair, drinking his delicious space coffee, waiting for the next space document needing his signature, the next space crisis requiring his leadership. It’s not long before that colony ship sends word that not one but two extremely suitable planets have been discovered. One of them is just lovely, but the other less lovely one is also surrounded by an ancient Precursor satellite array. “I’m having that,” shouts Sanders before hitting the big red Colonise button on his desk. It’s given the name New Vermont, after the state he governed centuries ago. Mankind’s first foray into the galaxy beyond Sol has not gone unnoticed. Our first alien encounter! The universal translator means that we can chew the fat all day long with our new alien buddies. The first thing they do, after welcoming us to the galactic community, is hit us up for money. This is a chance for Sanders to show the galaxy what mankind is all about, though, and what kind of a ruler he is. Helping out the less fortunate, the struggling, with foreign aid, which he’s voted in favour of in the past. As the Terran Alliance starts to expand, adding a second colony, it’s more important than ever to create an economic strategy that’ll allow humanity to flourish. Exciting stuff! Now, Sanders is a self-described democratic socialist, but based on his proposed policies – he believes that the government should not control the factories and banks, that it shouldn’t control the means of production – he’s not much of a socialist. Marian Tupy of The Atlantic argues that his views are more in line with social democracy, not democratic socialism. 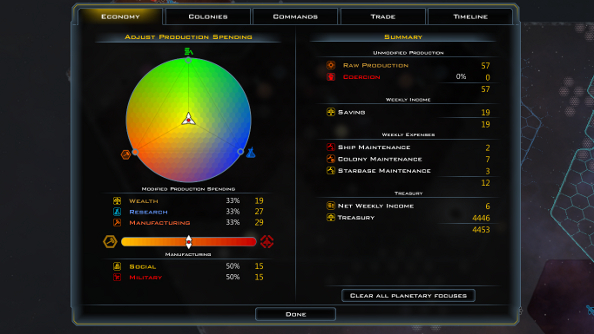 Galactic Civilizations III doesn’t really allow for such a distinction, however. As the leader of the Terran Alliance, Sanders is responsible for the creation of banks, marketplaces and factories. He’s also responsible for dictating what the entire empire should focus on: research, the acquisition of wealth or manufacturing. Trade is similarly controlled by the government. One key change made to the economy under Sanders’ guidance is the reallocation of production. Initially, it’s split equally between social projects and the military, but Sanders puts his foot down and makes it a 70/30 split in favour of social works. That means new factories, farms, research facilities and hospitals get built faster, but flying death machines will take a little longer. In the weeks that follow the creation of Sanders’ new economic policy, the Terran Alliance rapidly experiences the benefits. His approval rating is 100 across the Alliance, and everywhere there are new jobs and industries popping up on each planet. The focus on infrastructure and revitalising Earth’s industry has gone down well, and with humanity taken care of, it’s time to look further afield. It’s all kicking off beyond the borders of the Alliance. There are space pirates on the prowl, trade deals being made everywhere, and all these minor races popping up, asking the big guys for help. The first meeting of the United Planets, the UN of space, has also been scheduled. The Alliance has doled out foreign aid and been generally friendly and diplomatic in all its dealings with alien races, but despite this, when the UP votes for its chair, it’s the leader of the Altarian Resistance who wins it. A single tear falls down Sanders’ cheek. Humanity isn’t as loved as it should be. Here’s the thing – the Altarian Resistance are just awful. They see themselves as benevolent, progressive peacekeepers, but in all their dealings with the Alliance they’ve been nothing but rude and ridiculous. They keep offering to sell us useless technology for exorbitant sums of space bucks, while making – unprompted – offers like open border deals, again for cash. Bernie’s having none of it and keeps chasing them out of the Hexagon Office. 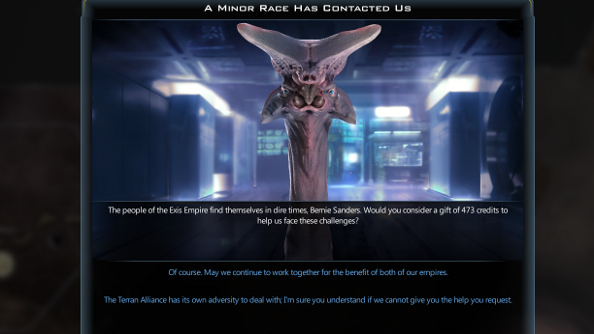 Other races, those without big space empires, are also trying to make deals, but more politely. The Orphica Enclave, for instance, reaches out to beg for the secrets of military technology. This isn’t the sort of foreign aid Sanders had in mind. Back in the 21st century, he did, as we’ve established, vote for foreign aid frequently, but there are caveats. Military aid has been one of them. Indeed, he voted against increasing military aid to Israel in 2016, a deal which was supported by the majority of his peers. However! While Sanders isn’t in the habit of handing out mass drivers and missiles to new alien friends, he does sympathise with them, surrounded by empires with vast armadas as they are. So he makes a new deal. He offers them defence technologies to better protect themselves, and in return the Enclave has to give the Alliance resources that boost the efficiency of human farms, allowing new colonies to grow faster. 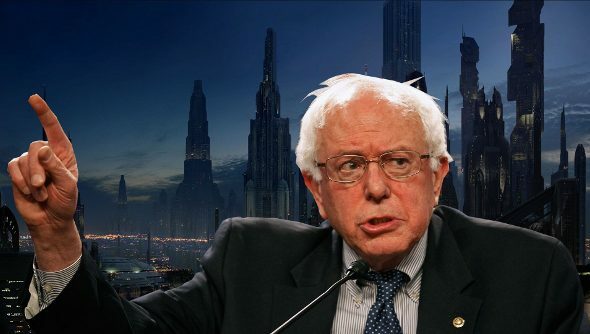 Many months into Sanders’ glorious reign, and the galaxy is starting to become a very dangerous place. 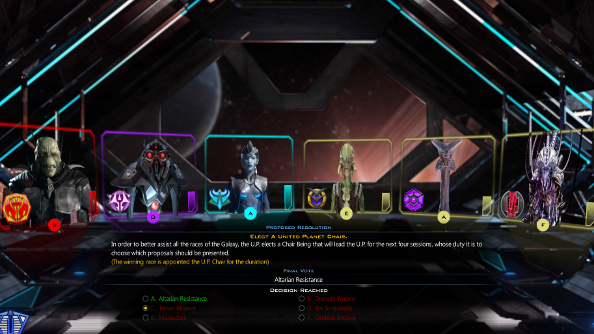 Space pirates have blown up two scouts from Earth, the Altarians snuck through our borders and colonised Mars, and the other two major factions – the Drengin and Yor – are throwing their weight around, making threats and generally acting like space dicks. And there’s the increasingly strained relationship between the Alliance and its closest neighbour, The Marauders. They’ve been building slave camps, and Sanders is refusing to offer them any foreign aid in light of this. He stops short of military intervention, however. At home, things are still looking good. When Sanders noticed that there was no public spending on education, he quickly rectified the oversight, offering free, unrestricted education for all. And when valuable trade resources were discovered on the world of Sethvir I, he made sure that all mining would be automated and cautious, as there was a risk of radiation. “No,” Sanders said, “We will not irradiate our colonists just to make a quick buck.” What a guy. The Alliance is not immune to what’s happening outside its borders, though. The alien empires are getting aggressive, especially now that there are very few habitable planets left yet to be colonised. They want to grow, but they can’t – not without war. And with the Alliance’s puny military, it’s become a target. We’re also incapable of helping the smaller races when the hostile Yor and Drengin declare war on them. Diplomacy is still the answer, Sanders decides. He makes a declaration of friendship to soothe the tension between the Alliance and the Altarians, offers more defensive technology to at-risk species, and finally embargos the Drengin, hoping to halt their war machine by refusing them foreign money and goods. Real progress is made in the UP, as well. Sure, sometimes it seems a bit like the feckless Galactic Senate from Star Wars, but this time the members vote to end all ongoing wars. It’s amazing. For a moment, the galaxy is at peace. It doesn’t last for long. As hostilities cease, it’s not hard to imagine what’s happening on worlds across the galaxy: fleets are being built, new weapons are being researched, troops are being trained. It’s not a real peace; it’s merely a lull in the war giving everyone time to rebuild their forces. Diplomacy is just buying time. Thankfully, the Alliance’s strong infrastructure and economy, as well as Sanders’ support of the sciences, mean that we’re in a good position to start building a competitive military. What technology we don’t possess, we get through deals with other races who, despite the tension across the galaxy, are happy to deal with Earth’s straight-shooting leader. 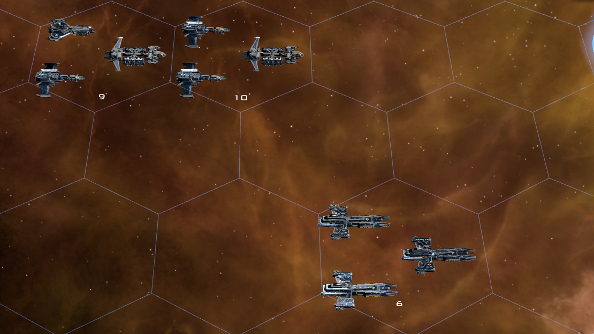 Fleets are sent to space stations throughout the Alliance borders, though purely as a deterrent, of course. 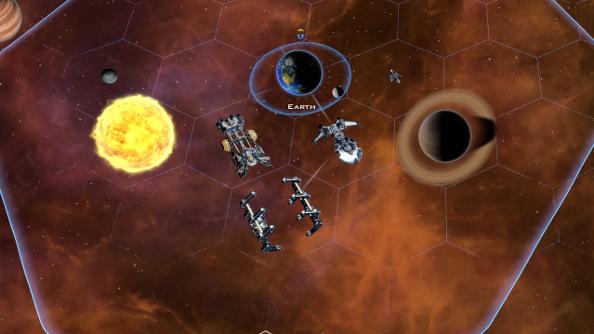 Not that it works, because a couple of months after the cessation of galactic hostilities, the Drengin declare war. On us. A Drengin fleet enters Alliance space, heading straight for Earth. It’s time for our cruisers to shine. As the fleet approaches the planet, out rushes the Terran armada, which had previously been chilling out in a nearby starbase. 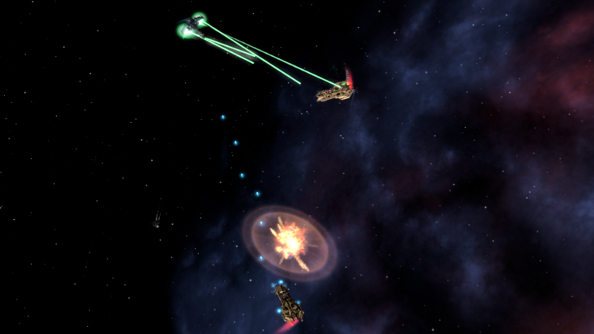 They strike, and while they take some losses, the Drengin fleet is utterly annihilated. Once more, Sanders attempts to find a diplomatic solution, but the Drengin leader, Lord Kona, isn’t even taking our calls. He’s just lost a major fleet at the start of a war, so I guess he’s feeling a bit sore. In the meantime, the empire is still a threat not only to humanity, but to the minor races that it’s been bullying for years now. If he won’t talk on the phone, we’ll just have to pay him a visit. Humanity’s largest ever fleet, made up of cruisers, corvettes, fighters and troop transports, crosses over into Drengin space in the middle of the 23rd Century. There, they are greeted by their allies in the Enclave. One by one the Drengin worlds fall, resulting in million of casualties, but also the liberation of countless slaves. Eventually there’s only one world left: Drengi, our foe’s homeworld. That’s when Lord Kona starts picking up the phone. He wants to make peace. But here’s the thing: if the Drengin Empire is left intact, then it will just continue to enslave people and threaten the stability of the galaxy. The Terran Alliance is not the galactic police, but the Drengin represent a serious threat to the Alliance and all other powers, and they’ve also gone rogue, ignoring the UP. It’s time to end this for good. As Sanders watches the fires of conquest engulf Drengi, he quotes Oppenheimer, because that’s just what people do in these situations. Diplomacy failed, and the Drengin are no more. It’s a bittersweet victory at the end of an unwanted war. Another unexpected result. Trump assassinated, Hillary killed off by Vikings, and Sanders forced into becoming a destroyer of worlds and galactic conqueror. What does this mean for the election? Nothing, silly. This is just a game.